Nissan's largest and most expensive SUV, the luxurious 2018 Armada is perfect for families looking for a full-size, 3-row SUV that seats eight passengers and has the power to tow up to 8,500 pounds. All-new just last year, the Armada is attractive, comfortable and with a starting price of around $47,000 it's a few grand cheaper than a Chevy Tahoe or Ford Expedition. All the extras that it comes with. Automatic windshield wipers. I love my armada, my husband works a Nissan. They are good vehicles. Very roomy we have a big family. I would recommend their vehicles, we have never had any major problems. We get good discounts for family and friends. My husband has been a Nissan for over 16 years. We really love all their products. The car and truck that we own, of course they are Nissan's to. We bought them new and are still driving them today. Get up & go power Altima by Nissan. I love the comfort of this car so much! It is very reliable & it gets very good gas mileage. The performance is amazing & I love the fact it has get up & go power when needed. Nissan put time in designing the layout of the dashboard amazingly with everything a driver needs being at reach. It has very good Audio throughout the whole car. It has tan leather, TVs, Bluetooth and can hold 7 people, and also braking. It has very good storages and you can put the back row down and have so much space for anything you need. It comes in beautiful colors and has touch screen by the driver and passenger side. 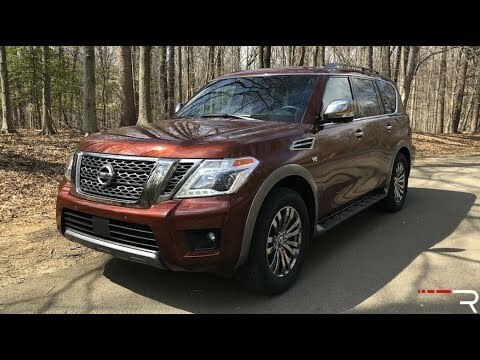 2018 Nissan Armada Platinum 4WD Review - Better Than Infiniti&#39;s QX80?